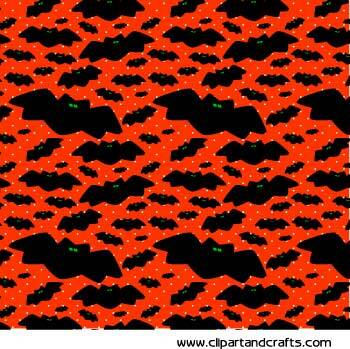 Flying bats printable paper sheet or pattern clip art, black bats printed on a seasonal orange background. Flying Halloween bats on pumpkin orange design paper. Printable gift wrap, or craft paper for Hallwoeen crafts, decorations or scrapbook pages. You can also use the 300 pixel bat paper graphic below as Halloween clip art. This printable Hallwoeen paper design is available in other colors: Green background bats paper, white background flying bats paper, purple background bat paper.